After a long gap, I am sharing a recipe with avocado because this healthy fruit is very rarely available in my place . So whenever I see it in Reliance fresh, I take one to try some interesting recipes with it. Avocado is popularly known as “Butter fruit” in India. So far I have tried and posted avocado paratha, avocado milkshake and Guacamole recipes and that too very long back. So this time I made Indian style, vegetarian avocado sandwich for a change. 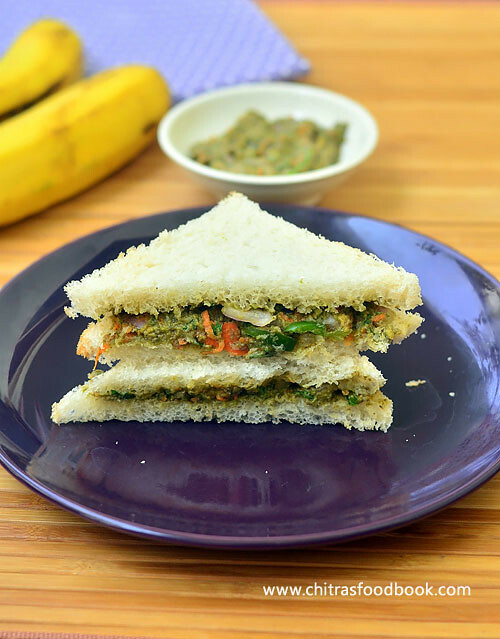 This no cook sandwich is a quick and easy breakfast/dinner recipe. Its a vegan recipe as well. You can use whole wheat bread to make it healthy and low in calorie. I don’t think kids would like this sandwich. If you use milk bread, add lots of grated cheese to the sandwich filling and toast it with butter, kids may like to have it . But this is an ideal recipe for adults who look for weight loss. One sandwich, a banana and a glass of milk was very much filling for me . You too give a try ! 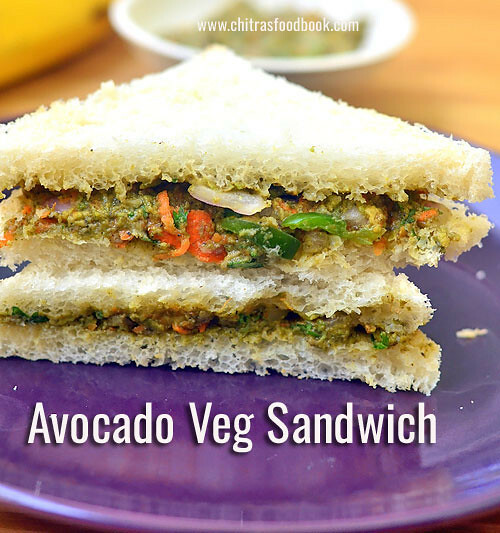 Lets see how to make this easy and quick Indian style vegetarian Avocado sandwich recipe with step by step pictures. 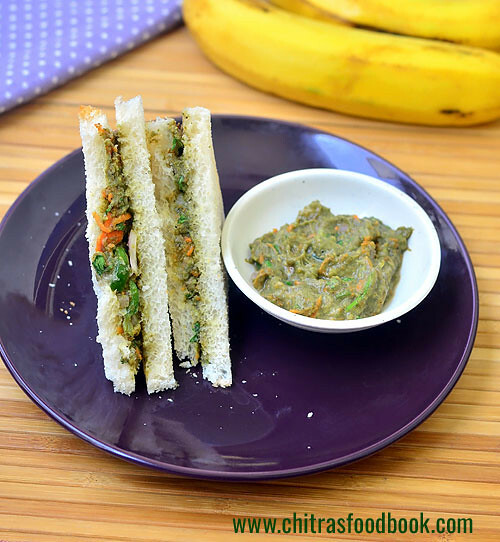 Indian vegetarian style avocado sandwich recipe - A very healthy breakfast/dinner recipe ! In a plate, wash and cut the avocado into two pieces vertically.Remove the seed with a knife. Scoop out the pulp and discard the skin. In a wide bowl, take the paste, grated carrot, finely chopped green chilli, onion, tomato, coriander leaves, required salt, chat masala and pepper powder. Mix well. Take two bread slices, trim off the sides if needed. Apply butter on one bread if needed.Apply the sandwich filling on the other bread.Cover it and grill or toast the sandwich if needed. I served it raw. 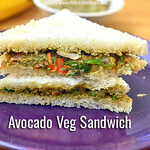 Try this easy, healthy avocado veg sandwich for your breakfast or dinner. You will like it for sure ! 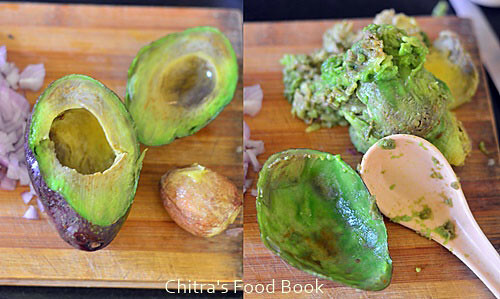 Chitra here is a tip for avocado. When you cut the fruit keep the seed in the bowl and mix with the other ingredients. The seed is what keeps the avocado green. You can discard is later.